Crestwood City Hall is located at 1 Detjen Drive, Crestwood, MO 63126; phone: 314-729-4700. Photo: Thomas Sappington House, ca. 1810, the oldest known brick structure remaining in St. Louis County. Historic American Buildings Survey [HABS MO-1173], Paul Piaget, photographer, 1960, memory.loc.gov, accessed September, 2012. The City of Crestwood was incorporated in 1947. Thomas Sappington was the second son of John Sappington, a revolutionary-War veteran who had come to this territory as early as 1804 and settled on a tract of 1920 acres. John gave part of this tract to Thomas when the latter married Mary Ann Kinkead in 1808, and this house, one of the oldest surviving brick structures in the state, was probably built at that time. It is one of a group of houses in the Crestwood area that was built by the children of John Sappington (there were eighteen in all) and their relatives. 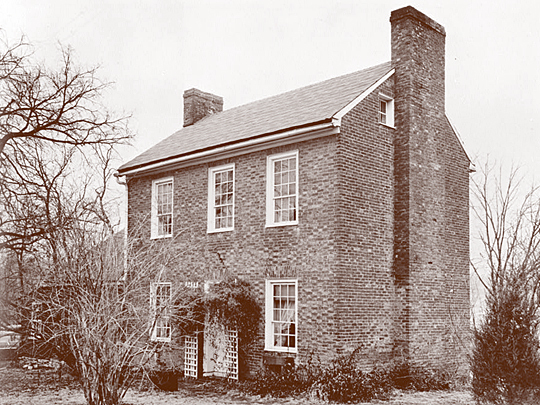 Zephaniah Sappington, the eldest son, built the house at 11145 Gravois Road, and Mark Sappington, the third son, may have built the later house at 8500 Old Sappington Road. William Lindsay Long, who married Elizabeth Sappington, built White Haven, at 9060 Whitehaven Drive and later the Long Log House at 9385 Pardee Lane. Joseph Sappington, who was a cousin, built 10734 Clearwater Drive. Thomas Sappington was born in 1783 in Ohio County, Virginia, now Brooke County, West Virginia. He served in the War of 1812 as a lieutenant under Major McNair, who was later to become Missouri's first governor. He died in 1860. His house is a prime example of the Federal architecture of Maryland and Virginia and most unusual in Missouri for its time. The moldings in the house are hand-turned, and the mantels are hand-carved. The house was purchased by the city of Crestwood in 1961 and restored by a committee chaired by Mrs. Walter Buxton, a Sappington descendant, with Gerhardt Kramer and William Bodley Lane as architects. The house was listed on the National Register of Historic Places in 1974.